Iranian workers have been staging large protests since early November in two major industrial complexes: the Haft Tapeh sugar plant and the Foulad steel factory in Ahvaz. In the case of Haft Tapeh, workers were protesting against the non-payment of wages, this time since August 2018. This is one of the many privatised plants where unscrupulous owners, often supported by one of the factions of the Islamic Republic regime, do not pay their workers for months at a time. Helped by their families, Haft Tapeh workers have managed to unite the population of the nearby town of Shoush to support their demands and join the demonstrations. Thanks to social media, the demonstrations, with workers’ anti-privatisation slogans, have became part of the country’s daily news. Like many other successful major industrial complexes, the agro-industrial complex was sold to the private sector in 2015 for the equivalent of $2 million – much less than its value. However, by 2017 the company owed $90 million – a combination of unpaid taxes and utility bills. The owners’ solution was to stop paying wages and steal from the workers’ pension funds. 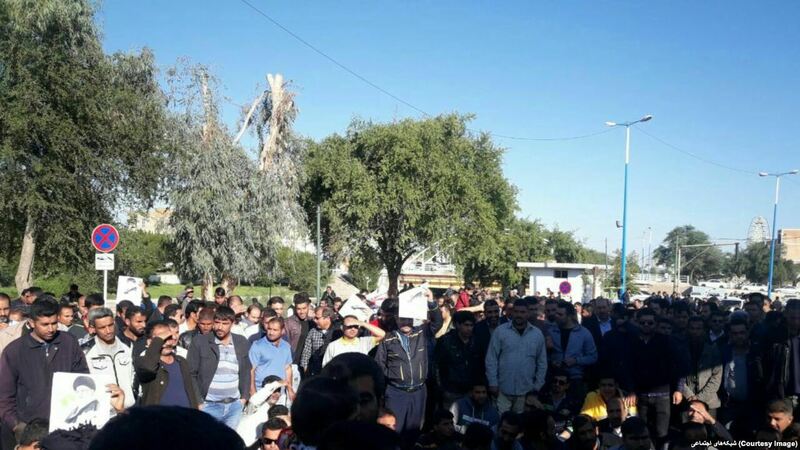 In Ahvaz, workers at the national steel plant, who had held a number of strikes in 2018 over unpaid wages, started using similar tactics to those of the Haft Tapeh workers, organising large protests outside their factory. Their main demand was that the company, which has seen a number of different owners over recent years, should be returned to public ownership. On November 8, a website which is linked to reformist factions in the government claimed that the names of a number of the company’s major shareholders and members of its board of directors are amongst the list of those wanted by the authorities for breaking Iran’s currency exchange regulations. However, instead of pursuing the owners, the government’s response was to arrest a number of labour activists, including Ismail Bakshi and former Haft Tapeh activist Ali Nejati, as well as a number of reporters and student activists associated with the protests. “Bakshi’s face is swollen and severely bruised as a result of receiving blows to the head,” said one. “He is also suffering from a dangerous condition with bleeding from the stomach.” He was transferred from prison to a hospital in Ahvaz. In response the local judicial authority was in complete denial that Bakshi had been physically abused. It was all “false news” aimed at “disturbing public opinion”. One of the interrogators told me while he was beating me that they know everything about me, because my phone was bugged long before my arrest. They told me they even knew about private arguments I have had with my wife over my labour activities … I was beaten up and tortured for no reason … I was so badly battered that I could not move for 72 hours in my solitary confinement cell. The pain was so unbearable that it made sleeping impossible. Weeks after my release, I still feel intolerable pain in my broken ribs, left ear and testicles. On January 5, Bakshi, who remains the spokesperson for the workers union at Haft Tapeh, challenged Iran’s minister for intelligence, Mahmoud Alavi, who is a cleric, to a debate on the torture of political detainees. By January 6 the issue had become headline news. The deputy speaker of the Majles (parliament), Ali Motahari, called on the government, and Alavi in particular, to investigate allegations of torture. On the same day Bakshi’s lawyer told reporters that he and his family are under pressure from the authorities to withdraw allegations of torture, but Bakshi provided more information about his interrogators. They told him they feared no-one, as they were the “unknown soldiers of the 12th Shia Imam”. For those unfamiliar with Shia mythology, the 12th and last Shia Imam is supposed to be in hiding, waiting for the right moment to make a reappearance in order to bring justice to the world. In the meantime Iran’s supreme leader, ayatollah Ali Khamenei, is busy preparing the grounds for the Imam’s return. Cynics would say he is doing a great a job in Iran’s Islamic Republic, creating the kind of unjust economic order that requires such divine intervention. No doubt it was Khamenei’s claim that protesting workers were agents of foreign powers that guided the “unknown soldiers of the 12th Shia Imam” to savagely beat up Bakshi. And here lies the supreme leader’s problem. You cannot stand up to imperialism (or the “great Satan”, as the Iranian clergy like to call the US) if you do not have the support of the majority of the population. When you adhere to the economic dictates of global capital, it is problematic to talk of “fighting global oppressors” and “building a resistance economy”, as Khamenei keeps repeating. The day-to-day experience of the Iranian people is that of capitalist exploitation and corruption in a country where one of the main economic priorities is to pursue privatisation. According to finance minister Farhad Dejpasand, who heads the Iran Privatisation Organization, “First on the agenda is financing, second is improving the business environment and third is to implement the principles of article 44 of the constitution and eventually defeat corruption by means of digitisation and organisation.” Article 44 was amended in 2004 specifically to facilitate privatisation. Of course, there are those on the left who think that, given the current level of threats against Iran’s Islamic Republic by rightwing forces, not least the Trump administration, one should keep quiet about the daily struggles of the Iranian workers. Such a position would allow the likes of US secretary of state Mike Pompeo and his co-thinker, Nigel Farage, to claim they support Iranian workers’ protests, helping to pave the way for imperialist ‘humanitarian intervention’. Fortunately, however, inside Iran there are very few who think like that. Most people are well aware that any so-called ‘humanitarian intervention’ would do nothing for ‘human rights’. It would have but a single aim – advancing the geopolitical hegemony of US imperialism. Otherwise we would have witnessed, if not US military action, at least forthright condemnation of Israel, as it continues to massacre Palestinians in Gaza. But apparently some on the so-called ‘left’ would end up supporting Trump’s ‘regime change from above’ in Iran. What these idiots fail to realise is that every military intervention, ‘humanitarian’ or otherwise, brings new recruits into the ranks of Islamist hardliners, Sunni and Shia. Apparently the US is “deeply concerned” about the “rapidly deteriorating health” of Meysami. But when he published his own response, it went viral. Meysami wrote: “I was shocked to see my name mentioned in the department run by US secretary of state Mike Pompeo, who has in the past wanted to ‘bomb Iran’.” Meysami would rather “spend my entire life in prison” than be linked to those who “turn their backs on moral and legal principles”, have abandoned the nuclear deal and impose “inhumane sanctions, which have dragged millions of my compatriots below the poverty line”. The attack on Haft Tapeh sugar workers proves once more that the new set of sanctions imposed by the Trump administration have actually strengthened the theocratic dictatorship in Iran, whilst drastically worsening the situation of the vast majority of Iranian people. Inflation and unemployment are out of control, but the regime’s expenditure on its apparatus of repression against the working class has been stepped up. Oppose Trump’s plans for regime change from above and expose the fact that the ‘alternatives’ proposed by Trump, Bolton et al would make the situation even worse. Expose the devastation caused by the neoliberal economic policies of the Iranian regime, including privatisation, the imposition of ‘blank contracts’, mass unemployment and the systematic non-payment of wages. Demand the immediate and unconditional release of workers arrested for their trade union or political activities and build genuine workers’ solidarity with their struggles. Feature image: Iran – Haft Tappeh sugar factory workers continue their strike and protests. Photo received by Radio Farda on November 28. Posted on Weekly Worker January 10, 2019.